Gingersnap Truffles are a nice seasonal twist on the every popular Oreo Truffles. They are decadent little bites of Heaven! A little prep work now, before the holiday craziness, can speed up your treat making a lot! What I love about making cookie truffles (Oreo or Gingersnap) is that you can make the balls ahead of time, ready for chocolate dipping, and freeze them. Then when you are ready to finish them, you can melt your chocolate, dip your frozen cookie balls and you are done! 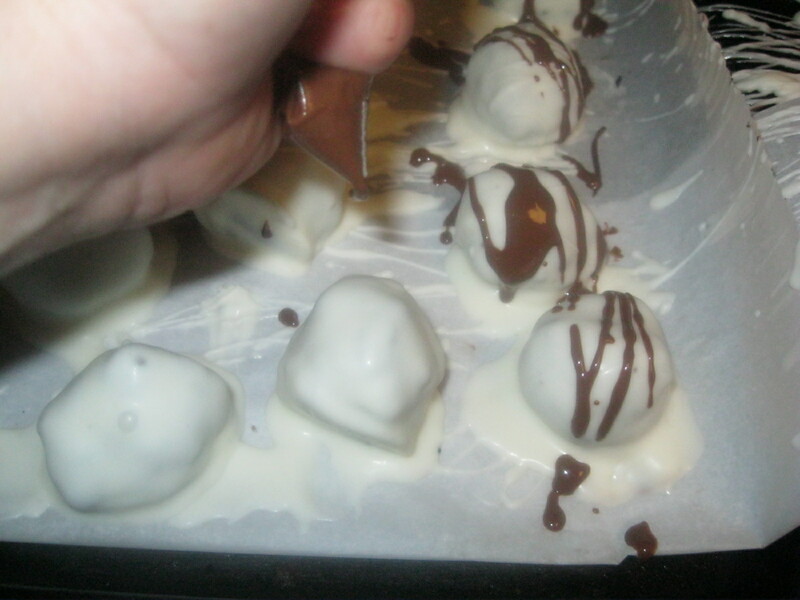 Jan's Tip: You can freeze the already dipped chocolate truffles, but when they thaw, the chocolate becomes sticky, so I prefer to freeze them undipped, and dip them in the chocolate right before I need them. Here's How I made them. Word of warning: Do not attempt to eat these without having a gallon of milk ready to go with them! If using a food processor put cream cheese ( I used 1-1/2 blocks) in, and mix together. If not using a food processor pour cookie crumbs into a large mixing bowl. Add Cream cheese and get your clean hands into it and mix it together (like you would a meatloaf or meatballs!) This part is great for the kids to help with! Roll dough into 1 inch balls and place on a greased or parchment/wax paper lined cookie sheet. Place cookie sheet into the freezer to flash freeze the balls for 10-15 minutes. 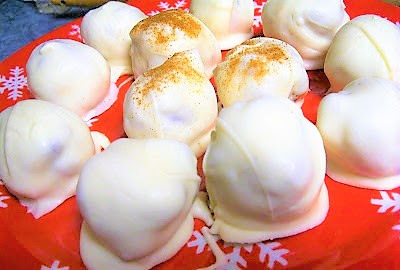 At this point if you want to make these later, once the balls or completely frozen individually, you can then store them in an airtight freezer container or bag till ready to finish them. While truffles are chilling in the freezer, melt your chocolate according to package directions. Pull truffles from freezer and dip into the melted chocolate, putting the dipped truffles back on the wax paper lined cookie sheet to set. A) Sprinkle Pumpkin Pie Spice onto the wet white chocolate before it sets. B) Wait till chocolate sets, and drizzle/pipe melted butterscotch chips or milk chocolate over the top.